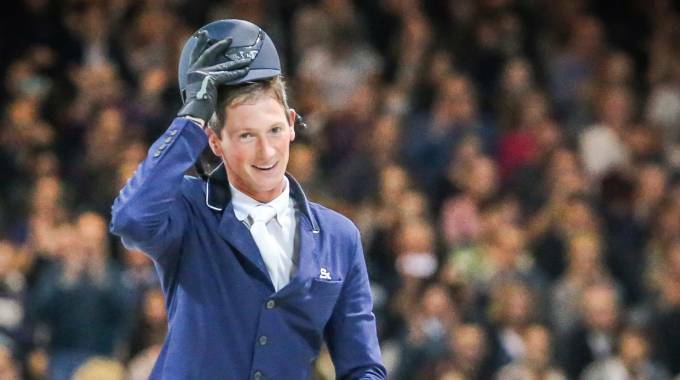 Verona, October 28, 2018 - Daniel Deusser (37), winner of today’s third leg of the Longines FEI Jumping World Cup™ 2018/2019 Western European League, admitted this evening that it was a last-minute change of plan that gave him victory. “The first question we all had when we saw the jump-off course was, is it possible to do six strides from fence one to fence two? I was thinking for me it was definitely seven because my horse would be hard to turn…and actually I only did the six because I saw Niels going in six, and I know that he has not the biggest horse and he was in the lead so I had to do the same!” the German rider said after bringing the crowd to their feet with a breathtaking last-to-go run with Calisto Blue. There’s something about Jumping Verona that always guarantees a thriller, and this was vintage stuff: "I’ve been here a couple of times with my best horses in good shape, and every year we have big sport with close results and a lot of people in a very exciting jump-off. So to be one time the winner here makes me very proud! ", said Daniel Deusser. The Italian fixture attracted a spectacular line-up including all three medallists from the individual podium at last month’s FEI World Equestrian Games™ in Tryon, USA, and their horses too. However new world champion, Germany’s Simone Blum, had a tumble with DSP Alice on Friday and although both are fine she decided to ride her young horse Cool Hill who had eight first-round faults. So when bronze medallists Steve Guerdat and Bianca also faulted in the opening round then silver medallist Martin Fuchs and his brilliant gelding Clooney were the only ones to make it through to the 14-horse jump-off. Fifth to go against the clock, Italy’s Luca Marziani set the crowd alight when storming home with Tokyo du Soleil in 39.69 seconds, but then Bertram Allen (23) raised the bar with a brilliant round from his 2014 Verona winner Molly Malone in 38.60 seconds to take the lead. However the young Irishman was immediately demoted by his Swiss friend Martin Fuchs who shaved 0.2 off that, and then Niels Brynseels and his incredibly quick mare Gancia de Muze re-set the target once more when blazing through the timers in 37.03 seconds. With just three to go it seemed that just couldn’t be bettered, and that the Belgian had it in the bag. Even Deusser doubted he could do it: "But I was last to go, and with the public and the atmosphere like that, I just stopped thinking about it and went in and I really wanted to try!". The roar of the crowd was enough to tell him he had succeeded, by an incredibly narrow margin of just 0.2 seconds. His expression of sheer delight said it all. He has only been riding the 11-year-old gelding Calisto Blue since July and it hasn’t all been plain sailing. “In the beginning it was very difficult, he’s scopey, very careful and fast but he’s very nervous. Especially with me with my long body, it was difficult to find the co-ordination because he was very sensitive. I’ve had good results in Grand Prix at Berlin and Brussels, but I was always fourth or fifth and he was never really able to win a class for me” explained the tall German. That was until today of course. Fuchs was very happy with his third-place finish and some valuable early points in the battle for one of the top-18 places in the Western European League that will take riders to the Longines Final in Gothenburg (SWE) next April. "This is my first big show since Tryon so many riders I haven’t seen since my (silver) medal have been coming to me to say congratulations and so it has been a very nice show! ", said the Swiss rider. Deusser was reminded this evening that he has finished first, second and third on the World Cup podium. “Yes my history in the World Cup sounds quite good if you look at it like that, but every year we start on zero again! It’s nice to start the season with 20 points, but it’s still a long way to the Final and I’m definitely hoping to qualify!” said the man who line out again next week in Lyon (FRA), the place where he posted his memorable series victory in 2014.